Definition at line 28 of file CTimeSeries.h. Definition at line 40 of file CTimeSeries.cpp. Definition at line 55 of file CTimeSeries.cpp. Definition at line 70 of file CTimeSeries.cpp. Definition at line 73 of file CTimeSeries.cpp. Referenced by CQGLNetworkPainter::createDataSets(), CTSSATask::initialize(), CTrajectoryTask::initialize(), and CCrossSectionTask::initialize(). Definition at line 96 of file CTimeSeries.cpp. References mAllocatedSteps, CMatrix< C_FLOAT64 >::mArray, mCompartment, mKeys, mNumberToQuantityFactor, COutputInterface::mObjects, mpEnd, mpIt, mPivot, mpState, mRecordedSteps, CMatrix< C_FLOAT64 >::mRows, mTitles, CMatrix< CType >::resize(), CVector< CType >::resize(), and CMatrix< C_FLOAT64 >::size(). Referenced by CTrajectoryTask::initialize(), CTSSATask::initialize(), and CCrossSectionTask::initialize(). Definition at line 113 of file CTimeSeries.cpp. References CVectorCore< CType >::array(), C_INVALID_INDEX, CStateTemplate::endFixed(), CCopasiObject::getCN(), CMetab::getCompartment(), CMetabNameInterface::getDisplayName(), CStateTemplate::getEntities(), CStateTemplate::getIndex(), CModel::getKey(), CCopasiDataModel::getModel(), CModel::getNumber2QuantityFactor(), CModel::getState(), CModel::getStateTemplate(), CStateTemplate::getUserOrder(), mAllocatedSteps, CMatrix< C_FLOAT64 >::mArray, mCompartment, mKeys, mNumberToQuantityFactor, COutputInterface::mObjects, mpEnd, mpIt, mPivot, mpState, mRecordedSteps, mTitles, CCopasiDataModel::ObjectFromName(), CMatrix< CType >::resize(), CVector< CType >::resize(), CVectorCore< CType >::size(), and CMatrix< C_FLOAT64 >::size(). 126 // We store all variables of the system. 127 // The reason for this is that events will be able to change even fixed values. Definition at line 223 of file CTimeSeries.cpp. Definition at line 243 of file CTimeSeries.cpp. References C_INVALID_INDEX, CMatrix< C_FLOAT64 >::mArray, CMatrix< C_FLOAT64 >::mCols, mCompartment, mDummyFloat, mNumberToQuantityFactor, mPivot, and mRecordedSteps. Referenced by CQGLNetworkPainter::createDataSets(), CQTimeSeriesDM::data(), and save(). Definition at line 234 of file CTimeSeries.cpp. 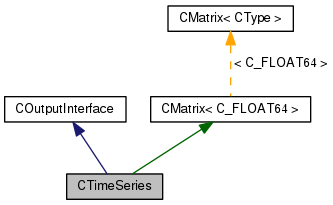 References CMatrix< C_FLOAT64 >::mArray, CMatrix< C_FLOAT64 >::mCols, mDummyFloat, mPivot, and mRecordedSteps. Referenced by CQTimeSeriesDM::data(), QTimeCourseAnimation::getMax(), QTimeCourseAnimation::getValue(), and save(). Definition at line 267 of file CTimeSeries.cpp. References CMatrix< C_FLOAT64 >::mCols, mDummyString, mKeys, and mPivot. Referenced by CQGLNetworkPainter::createDataSets(), QTimeCourseAnimation::getIndex(), and getSBMLId(). Definition at line 231 of file CTimeSeries.cpp. Referenced by CQTimeSeriesDM::columnCount(), CQGLNetworkPainter::createDataSets(), QTimeCourseAnimation::getIndex(), QTimeCourseAnimation::getMax(), and save(). Definition at line 228 of file CTimeSeries.cpp. Referenced by CQGLNetworkPainter::createDataSets(), QTimeCourseAnimation::getMax(), QTimeCourseAnimation::getScales(), QTimeCourseAnimation::initialize(), and CQTimeSeriesDM::rowCount(). get the id of the SBML object corresponding to column indexed by variable. If there is no corresponding SBML object (e.g. if the model comes from a COPASI file) the empty string is returned. Definition at line 275 of file CTimeSeries.cpp. References CKeyFactory::get(), getKey(), CCopasiRootContainer::getKeyFactory(), and mDummyString. Definition at line 259 of file CTimeSeries.cpp. References CMatrix< C_FLOAT64 >::mCols, mDummyString, mPivot, and mTitles. Referenced by CQGLNetworkPainter::createDataSets(), CQTimeSeriesDM::headerData(), and save(). Increase the allocated space for the time series. Definition at line 79 of file CTimeSeries.cpp. References mAllocatedSteps, CMatrix< C_FLOAT64 >::mArray, CMatrix< C_FLOAT64 >::mCols, mpEnd, mpIt, mRecordedSteps, CMatrix< CType >::resize(), and CMatrix< C_FLOAT64 >::size(). Definition at line 182 of file CTimeSeries.cpp. References C_FLOAT64, COutputInterface::DURING, CState::getTime(), increaseAllocation(), CMatrix< C_FLOAT64 >::mCols, mpEnd, mpIt, mpState, and mRecordedSteps. const std::string & separator = "\t"
Definition at line 348 of file CTimeSeries.cpp. References C_FLOAT64, CLocaleString::fromUtf8(), getConcentrationData(), getData(), getNumVariables(), getTitle(), and mRecordedSteps. Definition at line 202 of file CTimeSeries.cpp. References C_FLOAT64, increaseAllocation(), CMatrix< C_FLOAT64 >::mCols, mpEnd, mpIt, and mRecordedSteps. 216 // We copy NaN to indicate separation, which is similar to plotting. Definition at line 167 of file CTimeSeries.h. Referenced by allocate(), clear(), compile(), and increaseAllocation(). Definition at line 198 of file CTimeSeries.h. Referenced by clear(), compile(), and getConcentrationData(). Definition at line 223 of file CTimeSeries.h. Referenced by getConcentrationData(), and getData(). Definition at line 218 of file CTimeSeries.h. Referenced by getKey(), getSBMLId(), and getTitle(). Definition at line 208 of file CTimeSeries.h. Referenced by clear(), compile(), and getKey(). Definition at line 213 of file CTimeSeries.h. Definition at line 182 of file CTimeSeries.h. Referenced by clear(), compile(), increaseAllocation(), output(), and separate(). Definition at line 177 of file CTimeSeries.h. Definition at line 203 of file CTimeSeries.h. Referenced by clear(), compile(), getConcentrationData(), getData(), getKey(), and getTitle(). Pointer to the state which has to be recorded. Definition at line 187 of file CTimeSeries.h. Referenced by clear(), compile(), and output(). Definition at line 172 of file CTimeSeries.h. Referenced by clear(), compile(), getConcentrationData(), getData(), getRecordedSteps(), increaseAllocation(), output(), save(), and separate(). Definition at line 192 of file CTimeSeries.h. Referenced by clear(), compile(), and getTitle().